Taylor Hill's walk-off grand slam gave Passaic Valley a 16-13 win over Teaneck on Opening Day in Little Falls. LITTLE FALLS – From the first time Taylor Hill ever picked up a bat she dreamed what every softball player dreams. Stepping to the plate in the bottom of the seventh inning with the bases loaded and the game on the line, Hill needed just one pitch to make the most of the opportunity. 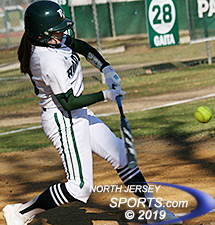 The sweet-swinging sophomore crushed a fastball over the fence in right-center to end an absolutely wild battle with a walk-off grand slam that gave Passaic Valley a season-opening 16-13 triumph over Teaneck on Monday afternoon at Passaic Valley High School in Little Falls. 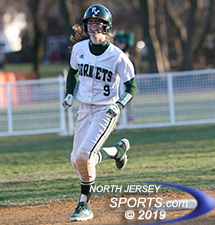 Passaic Valley came out swinging from the first inning with Devyn DiPasquale hitting a three-run homer to left-center that put gave the Hornets an early 4-0 lead. They took advantage of three second-inning errors to pad their lead to 7-1 after two innings. It looked as if the Hornets may run away to an easy win but an experienced Teaneck squad stayed calm and quickly responded. Margeaux Lesser and the Teaneck offense plated 13 runs in their first game of the season. Sydney Amaro and Madison Massey lined consecutive two-run doubles in the top of the third to cut the lead to 7-6. With two outs and a base open, Teaneck elected to pitch to Hill and she took advantage by roping a pitch inside the first-base line that went all the way to the wall for a two-run triple to make it 9-6. Hill’s only miscue came in the top of the fourth with a rare error that opened the door for the Highwaywomen. Margaux Lesser looped an RBI single before another error tied the game at 9. Despite the weather being frigid at best the tenor of the game felt more like a section final than it did like opening day. “I knew after that error that I had to do whatever it takes to make it up to my teammates,” added Hill. From there both teams went to their bullpens and the game’s frenetic pace settled down. 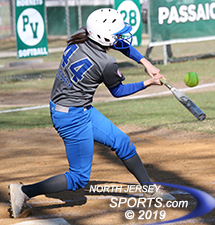 Teaneck’s Kayla Merrow and DiPasquale for Passaic Valley were both effective before the Hornets pulled ahead in the bottom of the sixth. After using a power-hitting approach throughout the game Teaneck switched gears going into the top of the seventh inning. The Highwaywomen used their bunting ability and some blazing speed to regain the lead. Brianna Bou laid one down and reached on an error. A base hit by Angela Generalao turned the lineup over to the top when Selena Davis laid an identical bunt down that was thrown away into foul territory down the right-field line. Davis never stopped running and came all the way around to score, putting Teaneck back in front. Merrow capped the inning with an RBI double for a 13-10 lead. Devyn DiPasquale hitting a three-run homer to left-center that put gave the Hornets an early 4-0 lead. The Hornets needed some good fortune and caught a pair of breaks to start the off bottom of the seventh. A pop-up in foul ground off the bat of DiPasquale was dropped. After working out a walk Brianna DeLuccia’s fly ball to right was catchable but dropped in to give PV some momentum. Five straight runners reached base to cut the lead back to one and turn the lineup back over to Hill at the top with the tying and winning runs in scoring position and still nobody out. With nowhere to pull Hill the lefty batter knew she was getting a pitch to hit. She did not waste any time by going after the first pitch and tattooing a no-doubter to send her teammates into a frenzy as they waited patiently to mob her as she crossed home plate to end arguably the craziest game any of the players on either team has ever played in. Hill finished with a career-high seven RBIs for Passaic Valley (1-0). The Hornets’ 7-8-9 batters (Sophia Payne, Rachel Alecci, and Madison Leech) combined to score eight runs. Four different players scored at least two runs for Teaneck (0-1). Senior third baseman Erin Emery, who in March became the first North Jersey girl in history to win a state championship in wrestling, led the way with three. Both teams came into the season with aspirations of being championship contenders in both county and state tournament play. With a big win in hand the Hornets feel this just the beginning of a truly special season.